This year’s Queen’s Awards saw the highest standard of entries yet. The most prestigious accolade of its kind, the Queen’s Awards for Enterprise celebrates the best and most innovative companies the United Kingdom has to offer. Handed out annually on the Queen’s Birthday, April 21, the awards recognise companies that have performed to the highest standard in the past year; traders and operators which hail from a wide range of industries and professions, from law and finance to farming and agriculture and beyond. The awards are made on the advice of the Prime Minister personally after they are assessed by an advisory committee. Winners of the award are not chosen by industry, and instead are picked from a pool of entrants on their merits and level of success in doing business overseas – 25% of all applicants managed to secure the award this year, an unusually high percentage. This year’s awards recognised companies that excelled in three categories: International Trade, Innovation and Sustainable Development. In all, 209 companies were recognised at this year’s award ceremony in April, all of which were judged to have performed with excellence throughout the past year. Of those winners, 151 were given the award for their achievements in international trade, a category which celebrates the achievements of British companies exporting and setting up abroad. Aside from the honour of being chosen to receive the award – which took on special significance in this, the Jubilee year – winners receive a customary crystal bowl and invitation to a reception at Buckingham Palace as a reward. Mark Prisk, who served as the Business and Enterprise Minister until the Prime Minister’s reshuffle in early September, praised the awards and its winners for their contribution to UK business and its interests overseas. “The Queen’s Awards for Enterprise are the highest accolade a business can receive. The standard of this year’s winners highlights the great work taking place by businesses of all sizes to help boost the growth of the UK economy. I hope that it will inspire more entrepreneurs to start or grow their business as we look to make 2012 the year of enterprise,” he said. Aside from just recognising the good work performed by companies during the year, the awards also benefit the companies in their future pursuits, boosting recipients’ profile and confidence. In a survey of the winners carried out by the Queen’s Awards Magazine, 83% of winners said that they thought the award brought an element of prestige to their business; 79% said that it brought about an improvement in staff morale; 63% said that it attracted more press coverage; and 48% said that they believe it gave them an edge overseas. One of the most successful companies at this year’s awards, Racelogic, which designs and manufactures electronic systems to record and analyse data from moving vehicles, agrees with the majority of the companies surveyed and believes that the award provided a great boost to the company and its staff. “The largest benefit we gain from these awards is an enhanced UK profile, which is very useful when finding new suppliers and recruiting staff. We have received congratulations from some of our UK customers,” explains Graham Mackie, Chief Executive at Racelogic, adding that despite its success, some of its international customers don’t quite understand the significance of the accolade. Racelogic, which also operates from a German operation in Weilburg, sells its products in 94 different countries worldwide and counts prestigious automotive names like Porche, Ferrari, BMW and Aston Martin among its customers. Mackie, who led Racelogic to wins in both the International Trade and Innovation categories, said that he was unsure about his company’s chances in the latter, but that it deserved the win. “With good year on year growth figures and more than 90% of our sales being made outside the UK we were reasonably confident we would get an award for Export but the Innovation award was nice surprise. Our LabSat product is unique in that it brings the world of GPS simulation down to a price that small and medium businesses can afford – allowing them to reliably test their GPS products, clearly the judges felt that this innovation was worthy of an award,” he explained. Another winner in the International Trade category is Tecna Display, a company renowned for its high quality portable and modular displays. It was the first exhibition display system ever to be given a Queen’s Award and proudly shows off the emblem on its website. “We have contacted all our overseas customers and they are all hugely impressed. The image of the Queen and the Royal family is also very prevalent at the moment because of the Jubilee celebrations, so this has added to our customer awareness worldwide. For Tecna Display to be recognised by the Queen’s Awards for our efforts and exports is highly significant and establishes us as best in class in our industry worldwide,” commented Jonathan Evitt, Tecna Display’s Managing Director and the developer of its flagship T3 Modular Framing System. Evitt also believes that the award has given the company’s staff a boost, and says that its customers are seeing the company in a new light. “It was great. The workforce were incredibly proud. I’ve had special QA T-shirts produced which they all wear in the factory as a new production “uniform”. It’s been great for morale,” he jokes. Evitt also explained that as a small company it’s very difficult to get any truly independent view of your business, saying that the Queen’s Awards does that and that it has given his him and his company a real sense of achievement that makes them feel that they are on the right track. Up to its recognition at the Queen’s Awards, Tecna Display had been an extremely successful exporter, seeing the amount of products its sends abroad rocket by 92% in the last few years, something Evitt attributes to the company’s highly innovative range of products and its worldwide patents and design registrations. “We have been extremely successful over the last few years with exports rising considerably, selling to more than 30 countries. We have ISO 9001, with a very strong quality control process and a lifetime guarantee on all our products,” Evitt explains. As a testament to the company’s success, Tecna display has been asked to supply the display walls for the official exhibitions at the Department of Business Innovation and Skills in Victoria and the northern exhibition for the winners and the award in Sheffield. One firm that is no stranger to the Queen’s Awards is Bridge of Weir Leather. 2012 was the company’s fourth win at the awards, and was well deserved considering the boom in trade it experienced over the past year. “Bridge of Weir won the Queen’s Award for Enterprise in the International Trade category for exactly that reason – ‘International Trade’”, explains Karen Marshall, Managing Director at Bridge of Weir Leather Company. “Our export sales growth has been remarkable over the last three years – with sales growing 150% during the period, and 90% of these sales made overseas. Specialising in automotive and contract design upholstery, Bridge of Weir leather exports to 60 countries worldwide. “Our unique brand of low carbon leather is down to the Thermal Energy Plant at Bridge of Weir – the only one of its kind in the world leather industry – that converts waste directly to energy at our manufacturing facilities and reduces our dependence on the grid for our energy – bringing benefits to both our customers and the environment,” explains Marshall. 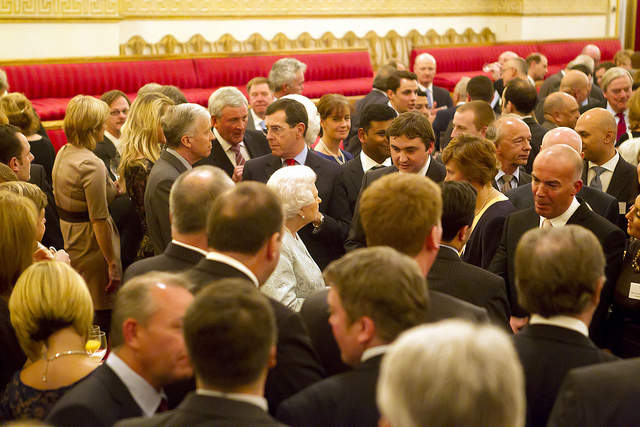 While most companies use the Queen’s Award to add an element of prestige to their business, Bridge of Weir has long been known as a premier leather producer, and was called upon in 1989 to reupholster the chairs and benches in the House of Commons and House of Lords. It still believes however, that the award can act as a powerful endorsement of its business. Founded in 1905, the company – privately held by Scottish owners – has expanded to include major operations in the United States, Mexico, China, Germany and Australia, and expects its growth to continue in the coming year, backed by the award and the exposure it has provided the company. “Continued growth through new business is certainly being supported by our latest Queen’s Award success. Underpinning this growth is a brand new factory at Bridge of Weir which we opened in September, extending leather making facilities in Scotland which service our customers all over the world,” said Marshall. Marshall added that the presentation – made by the Lord Lieutenant of Renfrewshire – was an extremely proud moment for the company and its employees, saying that it is a very exciting time to be at the company. It also marked the start of production at our new factory, which is a new state-of-the-art working environment for many at the company. The new factory will accommodate design, laser etching, embossing, lamination, perforation, cutting, sales, training, product presentations and showrooms, packaging, warehousing and international despatch facilities,” she said. “The new £2 million factory is now fully operational, supplying leather to automotive brands globally, including Aston Martin, Ford, Fisker, Jaguar, Land Rover, Mercedes AMG, Volvo and others. Aside from the automotive industry, Bridge of Weir also supplies leather to companies in the aviation, marine and hotel and leisure industries. “It is a very exciting time to be at Bridge of Weir,” added Marshall. Another company that earned a Queen’s Award was Morningside Pharmaceuticals. Founded by its current chief executive Dr Nik Kotecha and his wife. Morningside, based in Loughborough, Leicestershire, manufactures a wide range of pharmaceuticals and medical devices, and said it believes it won the award because of a substantial and continuous record on exports over the last six years. Morningside exports more than 60% of its products to over 80 countries worldwide. It has managed to drum up business from 54 new customers in the last three years alone. The Queen’s Award was followed by another trade award in May, this time at the Leicestershire Business Awards. It was also a finalist for the Leicestershire Business of the Year 2012 award. Outside of the International Trade category, 50 awards were presented to companies for their innovation in business and eight were awarded for their efforts at sustainable development. 11 individuals also claimed an award, the prestigious Queen’s Award for Enterprise Promotion, which recognises their efforts to foster entrepreneurial skills among businesspeople. The awards have been held every year since 1966, and were first established as the Queen’s Award to Industry. Past categories include Technological Achievement, Environmental Achievement and Export Achievement. Aside from receiving the accolade itself and a visit from a royal representative, winners of the award were invited to showcase their products at the Department for Business, Innovation and Skills in September. In order to be eligible to receive an award a company must have at least two full-time employees, be a self-contained enterprise and be able to demonstrate commercial success. Candidates can be based anywhere in the UK, the Isle of Man or the Channel Islands. Unfortunately for a company intending to enter next year’s awards, nominations for the 2013 edition ended in September. – Wow. I am simply blown away at the wodnfreul artistry and dimensionality you are able to illustrate so beautifully on a two dimensional canvas. Bravo! I am officially stalking your blog now. Congrats on the awards, which are all very well deserved! I look forward to seeing you speak at Mystic in January!